Each and every one of your constituents contributes what they can to support your cause. And for that, you appreciate all of them. 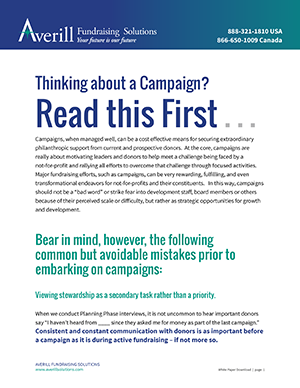 But if you’re gearing up for an ambitious fundraising project like a capital campaign, you need to know who to approach during the planning phase. Who can you rely on for major support? Ready to find prospect research resources for your nonprofit? Let’s get started! Sometimes, bringing on an expert is your best option, especially if you don’t have someone on staff with experience in the area of prospect research. Consultants are expert advisers who can set sustainable prospect research practices in motion at your organization. Access: Some consultants work remotely out of their office, while some will visit you on site for meetings. Make sure that you look for a firm geographically close to your office if you don’t want to work remotely with your consultant. Portfolio: Always ask for examples of a potential partner’s work. Looking through a portfolio will give you an idea of the consultant’s expertise as well as what you could expect from their work. Referrals: A portfolio can only tell you so much. Reach out to a consultant’s past clients, especially if the firm has worked with nonprofits like yours before, to ask about their experiences. Once you’ve found the right consultant, be sure to set up a reasonable timeline for your engagement and stick to it. For more helpful tips on how to find the perfect consultant, read Averill’s expert guide that leads you through the entire process in more detail. With nearly 75 years of combined experience, the Averill Fundraising Solutions team has worked with healthcare, education, cultural, and professional organizations, among many others. From feasibility studies to campaign planning, the team understands how to set up a fundraising endeavor for success. The Averill team can help you integrate your prospect research process with your larger campaign direction. And, if you want a hands-on approach, the Averill team also offers embedded staffing and leadership learning services. If you’re looking for a solution that handles everything for you, you’re looking for a prospect screening service. Screening existing constituents to find major contributors from a sea of familiar faces. Identifying new prospects that are likely to be interested in your organization. Managing your prospect database, including your prospect profiles and outreach. Integrate or migrate existing data and software with the prospect research process. Not all prospect screening services will offer all of these features, and some will offer more. As you search for the perfect solution for your nonprofit, keep your eye on your budget by only engaging with a provider who offers you the features you need. DonorSearch is at the forefront of the prospect research sector, with a 90% accuracy rate identifying potential contributors. That’s only achievable by supplementing machine-generated 70% accuracy with manual review by experts. The software is intuitive and easy to navigate online, with comprehensive prospect profiles, reports, a searchable database of all your prospects and existing constituents. An extra plus for healthcare-focused institutions: DonorSearch will batch screen patient records overnight for grateful patients. Think about it: when looking at two individuals, if one has given to charity before and the other hasn’t, who would you ask to support your organization? It’s a no-brainer that the individual who has shown their philanthropic spirit before is likely to show it again. Participating in corporate giving programs. There are many ways to review philanthropic records of your prospects, and many of them you can access form your local public library! So you can get into the world of prospect research on your own even if you don’t have the resources to hire a consultant or purchase a screening service. You could contact a nonprofit a day to ask for their supporter, volunteer, and staff records, but chances are slim that you’d get very far. Instead, you can rely on a database of that information provided by the nonprofits to GuideStar. Guidestar maintains financial profiles of nonprofits around the world. By registering with the website, you can search for any participating organization’s lists of key people and partners including board members, trustees, officers, and highest paid employees. Plus, nonprofits’ forms 990 are also available. When tackling prospect research in-house, it’s smart to start with prospective partners who have been involved in charitable work before. If their employer offers a charitable giving program or regularly gives to nonprofits. If they hold a top position within a company (or have started their own!). If they are professionally connected to other people you’ve worked with in the past. When looking for potential supporters of a major campaign, knowing a lot about a prospect’s professional life can tell you not just if you should approach them but how. Mention a specific charitable giving program your nonprofit would like to participate in. Acknowledge the prospect’s influence over the direction of the charitable giving program and offer to help develop it. Ask past supporters to reach out to the prospect on your behalf. A targeted, informed request is far more likely to garner a response. Knowing your prospect’s employment information can also help you determine exactly where they can best fit into your campaign. For instance, by pairing a potential donor’s philanthropic history with their professional records, you might find that they have a history of volunteering at or attending fundraising events. If they also hold a top position at their workplace or own their own business, they’d be the perfect candidate for sponsoring your next fundraiser! Even if the individual in question doesn’t have the ability to sponsor your event outright, you might still find they’d be interested in serving on an event planning committee or donating in-kind contributions on behalf of their business, such as auction items or event space. If the thought of searching manually through LinkedIn profiles makes you cringe, try an automated solution like 360MatchPro. Though the software is mostly intended to help nonprofits automate the matching gift process, 360MatchPro can do much more for your prospect research. The software pulls employer information from your constituents’ email domains, then builds them into your outreach strategy with automated gift tracking and reports that are easy to search and navigate. Keeping on top of your prospect outreach is always the hard part. 360MatchPro automates the process and incorporates matching gifts outreach as well. Who would have thought that real estate ownership could predict charitable giving? It turns out that someone who owns more than $2 million in real estate is actually 17 times more likely to give to a charity than someone who owns less in real estate. Value of property: Whether you’re asking for a small or a large contribution, it’s never a good idea to ask for something your supporters can’t afford — or significantly less than they could. Researching the value of your prospect’s property will give you a ballpark of their overall wealth profile and help you make a realistic ask. Location of property: We’re all connected to our homes and communities. If your prospects tend to own property within the same community or types of communities, look at your capital campaigns and show your prospect how contributing will benefit the area. Make the emotional case as well as the business one. Remember, real estate ownership can give you an estimate of a prospective contributor’s wealth status and philanthropic inclination. It’s not an exact science. So be sure to supplement this prospect research resource with others before embarking on the solicitation phase. Zillow is a frequently updated database of U.S. real estate information. Most people are familiar with the website as a resource for people searching for a new home or rental property. But since Zillow maintains profiles of properties off the market as well as those for sale or rent, it becomes a useful took for prospect researchers looking into the real estate ownership of their prospects. Don’t forget to look for rental properties and commercial properties that your prospects might own, not just residences. Similarly to real estate, individuals who give significantly to political causes are more likely to support a charitable campaign — 14 times more likely, in fact, than individuals who give less than $2,500 to political campaigns. Repeated political support to the same party or candidates demonstrates a contributor has strong loyalties and will stick by an organization they identify with. Trends in causes they support will point you toward prospects whose ideas are compatible with the mission of your nonprofit. Connections to other contributors on political committees can help you identify a personal connection between current and potential supporters. Contributions to political campaigns aren’t the only government-related giving you should look into. Transactions on the securities market for publicly traded companies are great indicators of a prospect’s wealth profile. When looking for government giving history, where better to go than government websites? Both the Federal Election Commission and the Securities and Exchange Commission maintain public databases of their transactions for anyone to search. The FEC maintains a database of giving to political campaigns, while the SEC tracks shares in publicly traded companies. These databases can get overwhelming, so give yourself plenty of time to dig into them. Imagine you’re building a profile for a prospect whose name is John Smith. Chances are good that he isn’t the only person in the United States named John Smith, and he’s probably not the only person in his state, city, or maybe even company, if he works for a large corporation. You need to always ensure that you’re gathering information about the right prospect, especially if you’re taking on prospect research by yourself. It’s imperative that you cross-reference your results with other public information about your prospects to ensure you’re getting your facts straight. That’s when you can take to resources of public information to find the details that ensure you’re looking at the right person. Quotation marks: Typing a name in the search bar will bring back results for each word individually. If you put the name “John Smith” in quotation marks, Google will search for the words together instead of separately. Location: Your prospects have to live somewhere, and that location will be tied to their name. Searching for John Smith and adding the location Tuscon, Arizona, will bring up news articles, social media profiles, and public domain documents that include both John Smith’s name and Tuscon, Arizona. Elimination: Is there a famous John Smith who always comes up in your search but isn’t the person you’re looking for? Include a hyphen (-) in front of a word that identifies that other John Smith to exclude him from your results. For example: Does this other John Smith work at Ford? Search for “John Smith -Ford” to remove him from your results. Last updated: If your prospect was a college football star or made headlines a few years ago by marrying someone famous, those search results can clutter your research. You can limit your results to websites updated within a certain timeframe by clicking on “Tools” below the search bar and changing “Any time” to the restriction of your choice. With these tools under your belt, you’re sure to narrow down to the right prospect no matter what their name is. Everyone needs a little help with prospect research, whether that means bringing on a prospect research consultant or screening service or finding a great online tool to tackle it yourself. This list of the top prospect research resources will help you identify those major contributors to your next campaign no matter how you go about it. Create a Capital Campaign Plan. Finding major contributors is only one piece of taking on a capital campaign. Make sure your strategy measures up with our five-step guide to capital campaign plans. Meeting and Exceeding Capital Campaign Goals. Need to refresh yourself on the bigger picture of capital campaigns? Check out our ultimate guide to exceeding your expectations on any capital campaign. Writing a Capital Campaign Case Statement. When sending solicitations to prospective supporters, you’ll need to provide a compelling reason why they should join the cause. Take a look at our free examples of effective capital campaign case statements.